It wasn’t long ago that I found this great YouTube video about the comparing of the Apple iPad and the LS 800 by Motion Computing. LatinVixen, a fellow illustrator, does a great little synopsis of the two devices and their pros and cons. I like the idea of an iPad, and I would love to get one, but they seem a bit on the pricey side to me. Call me a miser, but I’m betting that a big part of their popularity (and subsequent cost) is sorta self aggrandizing. This is all just the reason I thought it would be a good idea to watch the video and see what’s what. I’m so very happy that I did. Just a couple of days later, I’d found myself a device via ebay and purchased it for $350. It’s in great working order, and it runs Open Canvas 4 (my software of choice when sketching) without lag. I’ve since added a second gig of RAM (via a 2Gig chip in place of the original 1Gig) and it runs great. I haven’t bothered to upgrade to Windows 7 because I feel no need to. I had already purchased Open Canvas, so that was no additional cost for me. In the event that you don’t have OC, Latin Vixen has some other suggestions on her video, or you can always go with good ol’ GIMP. I’ve run the Portable Apps version on the tablet with no real issues. The vendor even gave me a great leather case, a small usb keyboard, and a Windows Recovery Disk in the deal, so I can fix it with fewer headaches if something goes awry. Your results may vary, of course – I recommend you do your homework for shopping for any vendor for used computer hardware. This all means that I got my digital tablet set up and running for less that $400. Compare that to the cheapest iPad (at ~$499) and even the smaller Cintiq (at ~$1000) and you’ve got one very happy illustrator. Forgive me – I’m a bad news first kinda guy. Reduced levels of sensitivity over traditional Wacom tablets. This isn’t the end of the world. In fact, in my humble opinion, it’s not even that big a deal. If someone had told me that before I bought it, I would have weighed it pretty heavily, but now? It’s not a problem. I wanted this to just be a ‘sketchbook’ – not something that I did finished work on. This could also just be caused by a setting that I have yet to notice/find. Angled sensitivity of the pen seems a bit reduced over traditional tablets. See above – this really isn’t a big deal. It gets hot. No, really. I’m talking hot. I haven’t had any major problem with this, but I also picked up a little ‘laptop fan’ device for a couple of bucks. It plugs into the usb ports and runs some extra fans beneath the machine to keep the air moving. But honestly? I only bother using it when I’m doing long stretches of drawing with the device. There’s another model I might have preferred. I’m not sure about this one, but Motion has a couple other devices that are sized differently (like the LS1600 at a 12″ screen). I might have liked having more ‘real estate’ to work on if I had spent more time looking. Honestly though, this one is lighter weight and very convenient to throw in a bag to keep with me. So much so that I’m still considering getting one of the other devices, but keeping this one in addition for its portability. It’s a Windows XP Tablet device! This is huge in my book. Unlike the Cintiq, which needs a separate device to run it, this is all contained in one unit. Simple. Elegant. Easy. It’s not a capacitive screen. When I’m drawing, I don’t get ‘smudges’ because I rested my palm. There are ways around this with the iPad, but why, if I don’t have to? 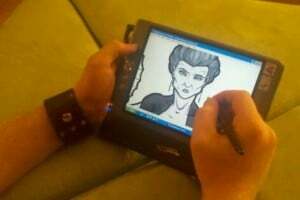 It’s got pressure sensitivity. While it’s true that I don’t think that it has as many levels of sensitivity as traditional Wacom tablets, it has far more than an iPad (which is binary). I can change the thickness of my brush or the darkness of the ink through how much pressure I put into it. This alone is worth the machine’s weight in gold. This unit isn’t an iPad. I can see why it didn’t sell like hot cakes to John Q. Public. It is, however, perfect for artists like myself who would like an inexpensive way to have a portable digital solution that doesn’t cost them a fortune. The fact that it will already work with your Windows based software, the interface is familiar, and it has pressure sensitivity all make it worth far more than you’re likely to pay for it. We just luck out because most vendors are pricing them based on what John Q. Public would spend on them. If you have any questions about the device, please feel free to ask them in the comments below, and I will be sure to answer them to the best of my ability. I’m also curious about other portable digital art solutions if any of you have any others out there – let me know. I’d love to hear about your experiences! Any Android artists out there?